Hotel Khanna Palace is a boutique hotel located at the serenity of Haridwar city. 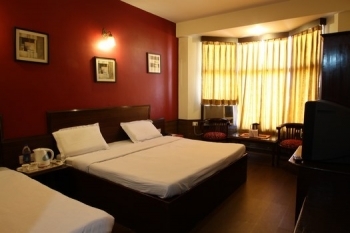 The hotel features elegantly designed stately rooms which provides a homely feel. The hotel has a soul refreshing ambience which blends perfectly with the divinity of the holy Ganges flowing gently in Haridwar. The charming hotel possess a functional elevator for easy accessibility on the floors. The hotel always keeps itself upto date with modern technology to offer a pleasurable stay to their guests. The hotel is located at Bhupatwala-Khadkhadi Road near Dudhadhari Chowk in Haridwar. Major tourists attractions such as Har Ki Pauri, Mansa Devi, Shanti Kunj, Chandi Devi, Bharat Mata Mandir and Pawan Dham are located at vicinity of the hotel. Lalita Ashram and Mahajan Hall are also located close to the hotel. 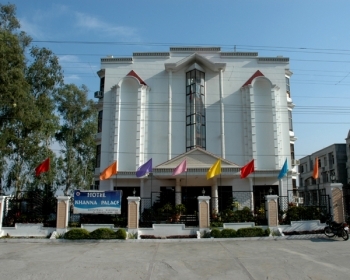 The hotel is at a favourable distance of 27 km from Rishikesh, the Adventure Capital of India. The hotel offers accommodation in (41) elegantly designed suites. All the rooms are centrally air conditioned. Each room is well equipped with amenities such as attach baths, hot/cold running water, bathroom toiletries, high speed internet access, intercom facility, refrigerator and many more. All Standard, Deluxe and Luxury rooms possess an authentic decor which adds a sophisticated charm. The experienced chefs of the hotel have endeavoured stealthily to stay true to the simplicity found in Indian cuisines. The uniqueness found in Indian food, its spiciness and aroma is left unhampered while enhancing the richness of the Indian flavours. The hotel serves an array of authentic cuisines from all over India North, South, East and West in its Krishna Restaurant. The meals are served at the exotic dining hall of the hotel which has a refreshing ambience. The hotel is located at Bhupatwala on Main Old Rishikesh Road in Haridwar. All cities in and around Haridwar are connected by state owned as well as private buses. Regular bus service is available from major cities like Jaipur, Jodhpur, Dehradun, Shimla and many other cities located close to it. Haridwar being a famous pilgrim place and a tourist destination possess a great railway network. Haridwar Railway Junction Station is connected well to major cities in India. There are also few trains that run frequently to Rishikesh at regular intervals. The nearest dosmestic airport from Haridwar is Jolly Grant Airport. It is located at about 20 km away from city center. The airport operates daily flights to Delhi at regular intervals. The nearest international airport is Indira Gandhi International Airport located at about 200 km respectively. It is well connected to most of the domestic and foreign airports.